I have been looking for a green fingernail polish for quite some time. As I’m sure with you, I would buy a polish because it looked great at the store, but the second I got home with it, I knew it was not for me. Especially the green colors. As you can see this color suits my coloring. 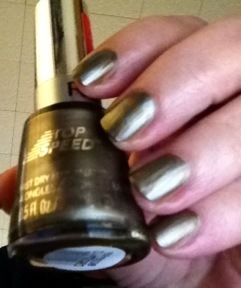 I like this polish because the formula is smooth and goes on without any fuss. I had been using quite a few Essie polishes before this one. And we all know Essie can be quite fussy to work with. This Revlon went on great. In fact I had been used to doing such thin coats with the Essie that this one would probably go on with one normal coat. The picture is with 2 coats and no top coat. I think it looks beautiful and it wears nice. What do you think?